The WNBA Board of Governors approved changes to playoff seeding and qualification procedures as well as the postseason format, effective with the 2016 season. Draymond Green and Klay Thompson of the Golden State Warriors headline the list of 14 players selected by the NBA’s head coaches as reserves for the 2016 NBA All-Star Game. NEW YORK – The WNBA’s historic 20th season tips off on Saturday, May 14 with five games, highlighted by an ESPN telecast of the defending WNBA champion Minnesota Lynx and the Phoenix Mercury at 7:30 p.m. ET. Cleveland Cavaliers head coach Tyronn Lue and his staff will coach the Eastern Conference All-Stars in the 2016 NBA All-Star Game. Spurs head coach Gregg Popovich will coach the Western Conference All-Stars in the 2016 NBA All-Star Game, to be televised by TNT at 8 p.m. ET on Sunday, Feb. 14 from Air Canada Centre in Toronto. Elliot Williams of the Santa Cruz Warriors was today named NBA Development League Performer of the Week for games played Monday, Jan. 18 through Sunday, Jan. 24. The NBA Development League All-Star Game presented by Kumho Tire returns to the NBA All-Star lineup for the 10th consecutive season on Saturday, Feb. 13. 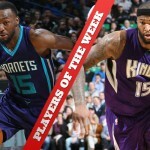 The Charlotte Hornets’ Kemba Walker and the Sacramento Kings’ DeMarcus Cousins were today named NBA Eastern and Western Conference Players of the Week, respectively, for games played Monday, Jan. 18 through Sunday, Jan. 24.